The Ibanez Roadster (not to be confused with Roadstar) was produced by Ibanez from 1979 – 1981 (possibly slightly earlier/later each way, but I’ve only seen catalogues/serial numbers from this period). Ibanez had had the lawsuit slapped on them that stopped them producing direct copies of Fenders and Gibson, and necessity being the mother of invention; Ibanez started to invent! Ibanez started producing some very original guitars and for many this period is considered a golden age. The Roadster was one of the early forays into invention rather than just imitation. The roadster design was short lived evolving into the Roadstar, Blazer and also the Studio Blazer hybrid (SB70). The Roadster name continued to be used for basses in 1981 and beyond, but the design changed somewhat: The headstock was like the Studio/musician series and a two pick up configuration was used. By this point the Blazer series resembled more closely the earlier Roadster guitars. The Roadster never quite received the attention of models such as the Artist, Studio or Musician Series, while some famous musicians did endorse the Roadster (notably Thin Lizzy’s Phil Lynott and The Boomtown Rat’s Garry Roberts) more musicians seemed to plump for other models. The Roadster had a lower RRP than the Artist, Studio or Musician and perhaps this gave the perception that it wasn’t as much of a professional instrument. Or possibly people simply preferred the other designs. Either way the lifespan of this guitar design in its’ original form was relatively brief. I’ve been lucky enough to have owned one of every model type of these early Roadsters (at least I think so, it’s always possible another model number might turn up!) and having also owned Musician Series and Artist Series as well as a number of other Ibanez guitars, I have no qualms in saying that the Roadster series easily holds its’ own with these guitars, and is well worth a go if you get a chance. 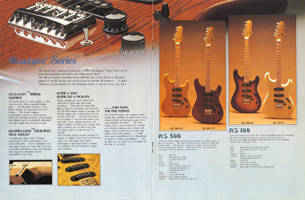 There are Roadster 6 string catalogue entries for the RS300 and RS100 (oddly no RS200). And I have seen shop listings for RS350s* and RS500. *there is some debate whether and RS350 is the correct model number, some believe there was a RS310 model number but not a RS350. Personally I believe the correct model number should be RS350, but either could be true. 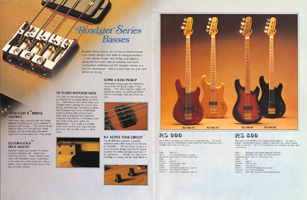 The earlier Roadster basses were available as RS800 and RS900. “It’s about time someone improved on the old designs”. That’s what we’ve been hearing lately and that’ just what we’ve done. The all-new Ibanez Roadster Series electrics are a step ahead of all other guitars of a similar design and construction in virtually all respects. A quick rundown of the features of the Roadster Series is sure to show you why.